Roy Chapman Andrews gained national fame as an explorer for the American Museum of Natural History in New York City. He began his career at the museum in 1906 by sweeping floors and assisting in the taxidermy department. By 1934 he had become the museum’s director. Andrews is best remembered for the series of dramatic expeditions he led to the Gobi of Mongolia from 1922 to 1930. Andrews took a team of scientists into previously unexplored parts of the desert using some of the region’s first automobiles with extra supplies transported by camel caravan. Andrews’s expeditions to the Gobi remain significant for, among other discoveries, their finds of the first nests of dinosaur eggs, new species of dinosaurs, and the fossils of early mammals that co-existed with dinosaurs. These materials remain the subject of exhibits and study, and they inspired a new wave of exploration in the Gobi by the American Museum beginning in 1990. So wrote Roy Chapman Andrews in Under a Lucky Star when describing his enthusiasm for exploration at the beginning of his career. Andrews never reached the Poles, and he gained his greatest fame for expeditions to the Gobi Desert of Mongolia during the 1920s. But earlier expeditions took him to different terrains and locations, including Saint Paul’s Island, one of the Pribilof Islands of Alaska. Andrews, a zoologist by training, spent several weeks there during the summer of 1913, studying fur seals and taking still and moving photographs. “For hours I lay concealed shooting bits of intimate seal life with the movie camera,” he reports in Under a Lucky Star. Andrews biographer Charles Gallenkamp notes that these efforts yielded “some of the most detailed footage of seals ever captured on film.” of charge. “Don’t court hardships,” advised Roy Chapman Andrews in On the Trail of Ancient Man. “Then…you are ready to take it in your stride and laugh while it is going on.” Andrews followed this advice when he inadvertently shot himself while trying to un-holster his revolver during the 1928 Gobi field season. With McKenzie Young (chief of motor transportation) acting as surgeon’s assistant, the camp doctor operated on the wound. Andrews noted that Dr. Perez “had given me such a dose of morphine that the world looked bright and rosy; in fact, I was rather pleased with myself.” The arrival of a lengthy sandstorm (and the fading of the morphine) “obscured my particular sun” later on. Nonetheless the wound healed without complication. Andrews was born at this house on January 26, 1884, the second child of Charles and Cora Chapman Andrews. At the time, the home was on the western edge of the City of Beloit. Beyond lay the “fields and woods and rushing streams” that Andrews explored in his youth. Andrews developed his skills as a naturalist and marksman during childhood rambles in the nearby woods, fields, and waterways. Andrews studied at public schools and the Beloit Academy. He taught himself taxidermy and used money earned from that hobby to help pay for his education at Beloit College. He graduated from the college in 1906 with a major in English. Among other courses he took at Beloit College were archaeology and evolution, unusual subjects for the day, which were taught in conjunction with the school’s Logan Museum of Anthropology (founded in 1893). The June 1911 issue of “The Beloit Alumnus” (Vol. 2, no. 3, p.16) contained the following note about RCA, who was in the Beloit College graduating class of 1906. “1906. Roy C. Andrews, who has won fame for his great discoveries in whale research, is booked for another fine expedition next fall, if plans do not fail. He expects to leave New York about Nov. 1, make a trip to Korea, where he will spend the winter months, and then go north to Siberia, and the coast of Norway. He has had full charge of the department of mammals in the American Museum of Natural History during the absence of the Director, Dr. Allen, and if the latter, who has not been very well, is able to carry on the work at the museum, Mr. Andrews will make the trip as planned. The appointment of Dr. Lucas as director of the museum in New York may mean better things still for the former Beloit boy, as the doctor wanted Mr. Andrews to go to the Brooklyn Museum with him when he decided on entering the New York institution. On March 31, 1905 during his junior year of College, Andrews nearly drowned during a boating accident on the Rock River with a college professor (who did drown) on the flood-swollen river. The site of their accident is located on privately held land on the east bank of the Rock River just north of the Townline Road bridge just north of Beloit. His escape and subsequent knack for surviving adventures prompted Andrews to conjecture that he must have been “born under a lucky star”. In March 1905, Roy Chapman Andrews and Montague White decided to go on a duck hunting trip. Andrews, a junior at Beloit College, was 21 years old; Monty White was 23 and a member of the English Department. The choice of timing for their outing was probably more influenced by the fact that Beloit College classes were in recess for a spring break than because the month presented ideal hunting conditions. In fact, circumstances for boating on the Rock River were not good at all. The river had been steadily rising for days. No dramatic storm or weather change had caused the increase; instead the river crept higher so gradually that many were surprised when it registered one of its highest water marks ever and stayed at that level for more than ten days. Monty and Roy had already been camping for several days near the confluence of Young’s Creek (perhaps today’s Bass Creek) and the Rock River, six miles north of Beloit when their boating accident occurred. Roy and Monty probably did not know it, but just two days before, a 15-year-old Beloit boy-playing with friends on the Northwestern Railway Bridge-had drowned after falling from the bridge into Turtle Creek. Here’s what happened when Roy and Monty set out to hunt on Friday, March 31, 1905. As their trip got underway, Monty accidentally dropped his paddle overboard and, lunging to reach it, upset their unsteady craft. Both men were dumped into the icy flood waters. Monty began swimming for shore, then suddenly sank from view. Roy, swept in the opposite direction, was unable to help his friend. After a struggle, Roy finally escaped the current. He rested on a submerged tree limb long enough to restore some circulation and strength in his arms, then he pulled himself ashore. Next he staggered through flooded fields for more than an hour to reach help. Although Roy eventually found safety, Monty did not. When his body was recovered from the river, its twisted shape showed that muscle cramps had seized him before he could swim to shore. Andrews went on to have many adventures after he took up his profession as an explorer for the American Museum of Natural History in New York. None ever ended as tragically as this first one. Perhaps the grief and remorse Andrews felt over the loss of his friend helped shape the commitment to safety and preparedness that he followed during his 22 years of field work. This story was adapted from remarks given at the Andrews birthday party by Ann Bausum on January 26, 2001, and from the text of her book, Dragon Bones and Dinosaur Eggs-A Photobiography of Explorer Roy Chapman Andrews (reprinted with permission of the publisher, National Geographic Society). Andrews was forced to abandon field work in Asia after 1930, because of the region’s political instability and the financial challenges of the Great Depression. He retired as director of the American Museum in 1941. The famed explorer spent his retirement years writing and speaking about his career. His books for young readers, particularly the title All About Dinosaurs, are credited with inspiring a new generation of scientists to follow him into fieldwork, including paleontologists now working in the Gobi. 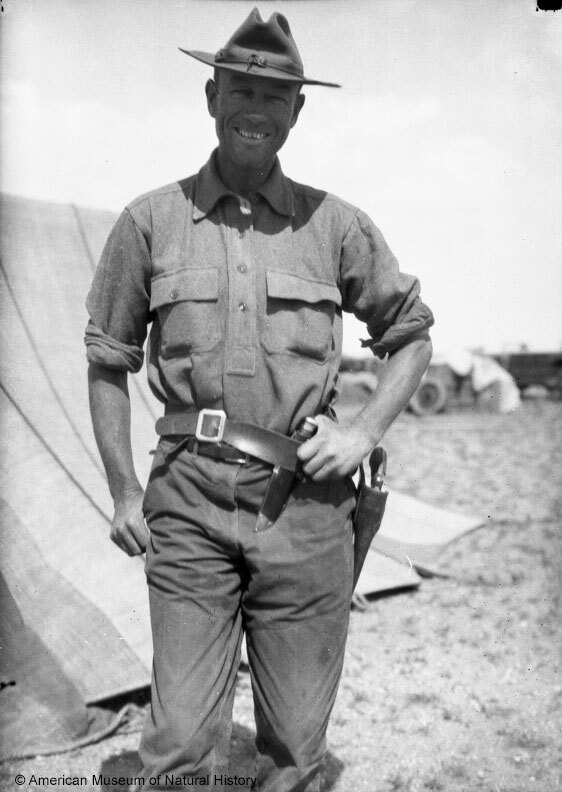 Roy Chapman Andrews was famous for his adventuresome lifestyle. He retold many of his favorite tales in his numerous works of popular adventure, most notably Under a Lucky Star (Viking, 1943) and Ends of the Earth (Putnam, 1929). In the [first] fifteen years [of field work] I can remember just ten times when I had really narrow escapes from death. Two were from drowning in typhoons, one was when our boat was charged by a wounded whale, once my wife and I were nearly eaten by wild dogs, once we were in great danger from fanatical lama priests, two were close calls when I fell over cliffs, once was nearly caught by a huge python, and twice I might have been killed by bandits. Roy Chapman Andrews was a prolific author. In addition to publishing many books he also contributed numerous articles for both scientific journals and popular magazines. Many renown paleontologists, naturalists and scientists cite reading one of Roy Chapman Andrews own books or accounts in other publications or magazines as the inspiration for their entering their own field of study and exploration. Heart of Asia: True Tales of the Far East–? 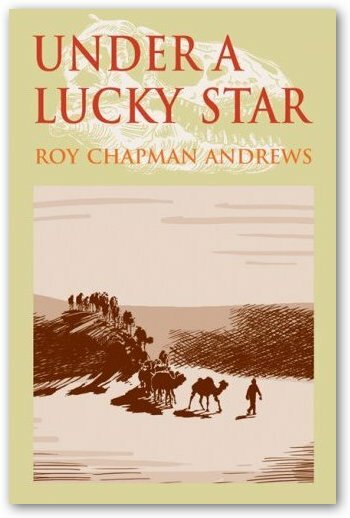 Under A Lucky Star by Roy Chapman Andrews is available through Borderland Books and at RCAS events. Andrews died in California at age 76 on March 11, 1960. At his request, his remains were cremated and buried in the Chapman family plot in his hometown, Beloit Wisconsin as he had requested. Others resting nearby include his parents, grandparents, and sister Ethelyn. The Chapman plot is directly left (west) of this point and is marked by a stone obelisk. A historical marker was dedicated on September 5, 2014 commemorating Andrews’s lifetime ties to Beloit and his expeditions on the Rock River as a boy. The national marker is located south of the Turtle Island Playground. What Else Awaits Your Discovery?